Katy Lessick, a Chardon High School senior, has a passion — and talent — for music. The singer, future composer and music director wanted to give back to her school community. She was granted a Make-a-Wish following a battle with the diagnosis of a malignant brain tumor. The foundation in Ohio, Kentucky and Indiana provides a wish experience for children who are diagnosed with a critical illness. 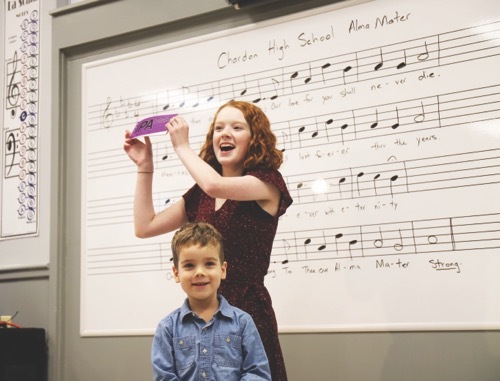 Katy decided to use it to create a choir room of her dreams — something that not only she will enjoy before she graduates, but also future students. The project began last year when Katy discussed her wish with her music teacher, Fritz Streiff. “I was in disbelief and floored when she first told me,” Streiff says. “She was very excited about it and it’s a blessing for all of us. I am deeply honored by her thinking of us and me. She thinks enough of the program here and she wants to give back. “It was a collaborative effort,” he says, adding that funding was provided by donors such as the rotary club, Chardon City Schools, and others. As renovations progressed, Katy and her classmates slowly saw improvements in the room, including a new paint job, piano, acoustic paneling and posture chairs — but now the room is complete. Last month, Make-a-Wish, along with Katy’s family and friends, had a wish reveal party. Not only did Katy get to officially celebrate her wish, she also received a donated Sweetwater keyboard for her future dorm room. “It’s beautiful,” she said after playing a few notes. Other musical gifts were given from the staff of the middle and high school.